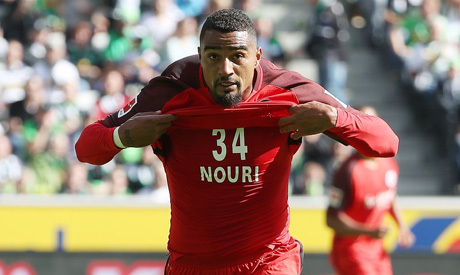 Kevin-Prince Boateng earned Eintracht Frankfurt a hard-fought 1-0 win at Borussia Moenchengladbach, but couldn't finish the game due to injury. Boateng fired home from close range in the 13th minute for his first Bundesliga goal since his return after spells at Milan and Las Palmas. He celebrated with a tribute to Ajax midfielder Abdelhak Nouri, who suffered severe brain damage after collapsing during a friendly match against Werder Bremen in July. "I don't know him but the story really moved me," Boateng said. The Ghana midfielder had to go off early in the second half. He received treatment toward the end of the first after receiving a blow from Jannik Vestergaard's elbow.